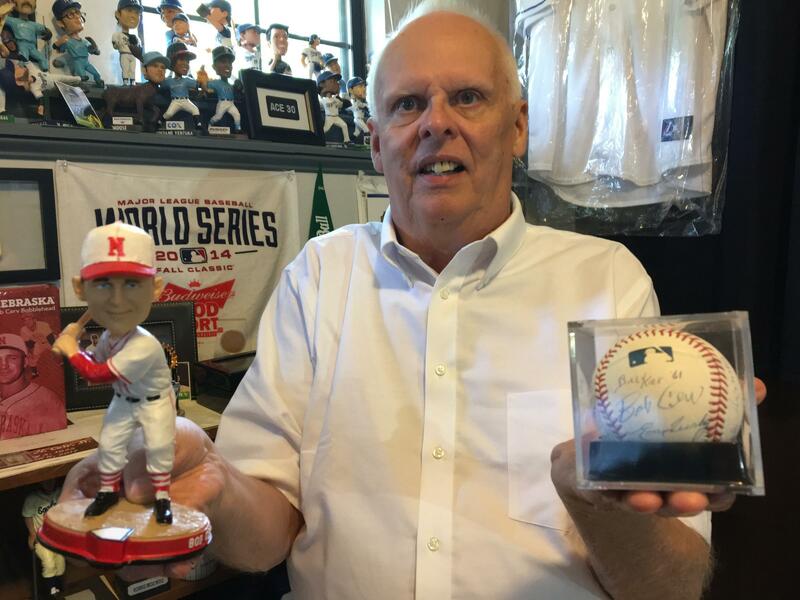 A Bob Cerv bobblehead, given away this year at a Huskers home game, and an autographed baseball card sit among Ray Van Eman's baseball memorabilia. Bob Cerv holds the Kansas City A's record for most home runs. In 1999, I collected a series of essays for my book called “Sacred Records.” The year before Mark McGwire of the St. Louis Cardinals broke the one-season home run record set by former Yankees slugger Roger Maris. There was a lot of discussion at the time about the sanctity of the Maris record, reminiscent of 1961 when Maris broke Babe Ruth’s record. 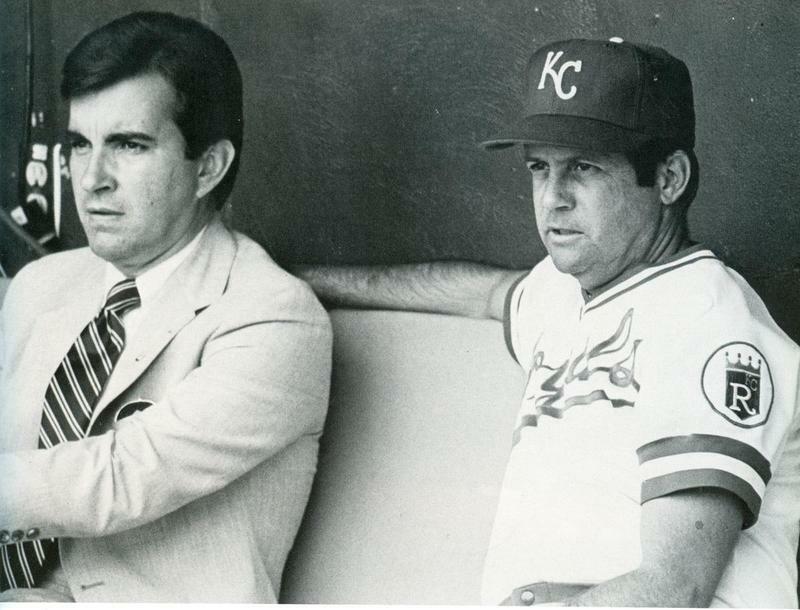 In Kansas City, there’s Balboni’s record, but then there’s Bob Cerv’s. He set the Kansas City A’s record, hitting 38 homers in 1958. Little did Cerv know that his record would be under a lot of discussion. Joseph Cerv, one of the baseball player’s ten children, is a partial season-ticket holder for Royals games. He lays out the Mike Moustakas challenge: “There’s a Royals record and there’s a Kansas City record. I think the one that is the most home runs hit by a major leaguer in the summer is the record for Kansas City." A Bob Cerv-autographed team picture of the 1958 A's, Cerv's home run record-setting year, hangs on Ray Van Eman's wall. After being traded back to the New York Yankees, for whom he played before the A’s, Bob Cerv roomed with Maris and saw the pressure Maris felt when approaching Babe Ruth’s record. This isn’t to suggest that Moustakas is under the same duress. In fact, when Moustakas was recently asked about the rash of homers that put him on pace to break the Royals record, he shrugged it off. Unlike Moustakas who came up as an every-day third baseman, Cerv played sparingly in his first stint with the Yankees. After the 1956 World Series, Cerv was sold to the A’s. In a 2009 interview, he reflected on it. Cerv was known for his massive hands and strength at 6 feet and 220 pounds. In the ‘58 All-Star Game, Hall of Famer Ted Williams didn’t start in left field. Bob Cerv fan Ray Van Eman holds a Bob Cerv bobblehead and an autographed baseball among his baseball memorabilia. Cerv took that spot. He also played a month on a liquid diet because of a broken jaw from a home plate collision with a catcher. Six of Cerv’s 38 homers were hit with his jaw wired shut, more than the total number of homers he hit in six years of part-time duty with the Yankees. There are some in Kansas City who view Cerv’s home run record as sacred. Ray Van Eman of Merriam is one of them. “I don’t want Moustakas to break it,” declared Van Eman. Van Eman is a member of the Bob Cerv Appreciation Page on Facebook. He says he grew to respect Cerv and what he accomplished by getting to know him after his major league career. 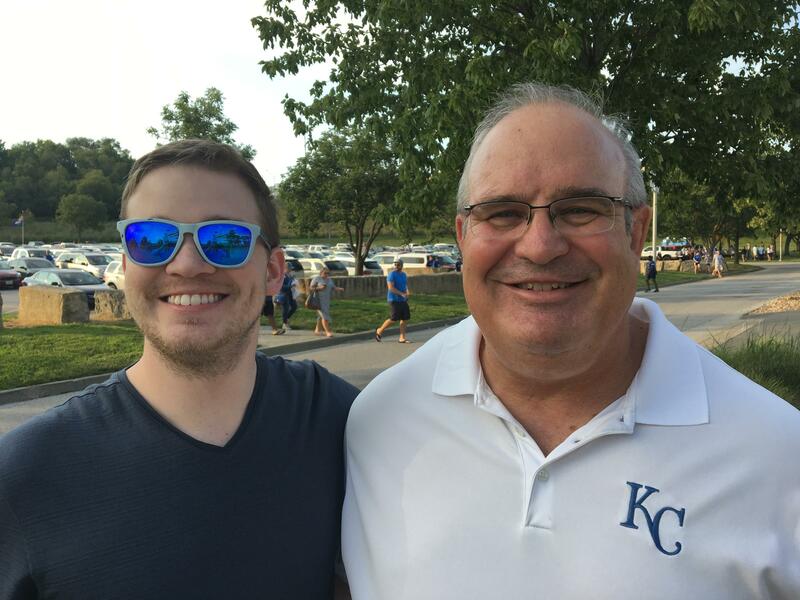 Jamie (L), grandson of Bob Cerv, and Joseph (R), son of Bob Cerv attend Royals home games. Joseph Cerv says he’s prepared for the record book to be re-written. “He (Bob Cerv) held it for a lifetime. All our best wishes to 'Mous' because we want to get to the playoffs this year,” said Joseph Cerv. He adds that, if anything has come out of all this, the family name circulates around Kansas City in the same manner as in Bob Cerv’s heyday in the late 1950s. “It does. You have a special place there,” says Joseph Cerv. And Bob Cerv, who so far has held the city’s home run record for 59 years, will always have a special place in Kansas City baseball, even if that record is broken. Greg Echlin is a sports reporter for KCUR 89.3. You can reach him on Twitter@GregEchlin.